This is a wonderfully soft and moist banana cake recipe. Thanks to Lucy for sharing this very nice recipe. The texture of the cake is soft, light and moist at the same time. I have made some very slight changes to suit my personal taste. I replaced the banana essence with vanilla essence as I personal do not like the artifical smell and taste of banana essence. I have also cut down on the amount of sugar. If you are using riped bananas, they are naturally sweet on it's own. Unless you have a very sweet tooth, cutting down on some of the sugar required will be a good idea. This inside of the cake. Soft and moist. (1) Cream butter and sugar till light and creamy. (2) Pour in eggs gradually and beat till creamy. (3) Add in whip cream, mashed bananas and banana essence and mix well. (4) Add in cake flour, baking powder and bicarbonate of soda and beat for a while only. (5) Pour into an 8" round tray, and arrange sliced bananas on top. (6) Bake at 175C for about 50 to 60 mins. or until cooked. Lee, I luv this cake very much. Yours look very good. Ya lor, Jes, this cake is nice. I also like it. I love your banana cake. How much sugar did u cut down. I too don like it too sweet. 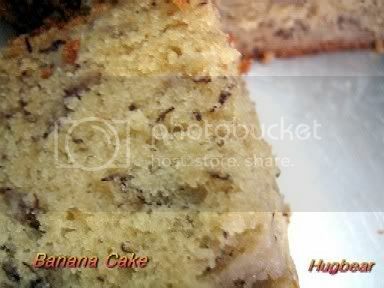 Hugbear, I stumbled across your blog about a month ago....and took a note of your banana cake recipe here. I tried it today and it is absolutely fabulous so I thought I should come back and thank you for it. I have actually blogged about it with where I got the recipe from. 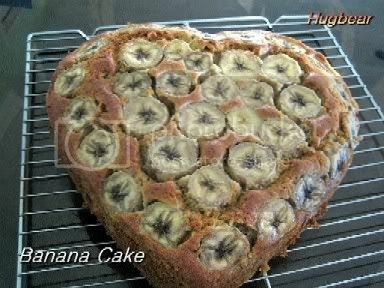 dr ve thru, thanks for letting me know that you love the banana cake recipe. Do you blog a lot too? Where? Since then, I have made the same recipe but with blueberries instead and it was perfect. Everyone at work enjoyed it so much and some even asked for the recipe. I have two blogs but my food blog is nothing like yours. Yours is fantastic and so organised. Once again, thank you. Thanks very much for sharing your wonderful recipes hugbear!! I wana try out your banana cake but got a question here. I'm very new in this baking hobby thus i'm not sure if i pour the batter onto the springform, wouldn't the batter flow/leak out from bottom?? If you are using a springform pan, make sure you wrap the bottom of the pan with aluminium foil to avoid any leakage. Also remember to line the pan for easy removal of the cake. Hugbear, i stumbled on your blog a few weeks ago. i'm very new to baking. i tried this recipe today. like the taste. however, my cake got burnt on the bottom. i used a 8" springform pan, lined it but didnt wrap the bottom with aluminium foil (thought it looked all right cos it didnt leak so didnt bother wrapping it!). almost at the end i realised that it was leaking!! is this the reason why the bottom of the cake got burnt? i really have no idea as i'm soo new to baking. thanks. Hi Hugbear, i'm the one who asked u how to use a springform. Just wana let u know that i've tried to bake the banana cake last nite and today brought to office. Everyone loves it.. :) i feel so satisfied!! THANKS ALOT FOR SHARING SO MANY WONDERFUL RECIPES!! For the step 3, mix well = using spatula or using the mixer? Roughly how long? For step 4, which speed should i use to "beat" the cake flour, etc and for how long? Step 3, I turn it to low speed and add the ingredients in. Step 4, I added sifted flour and use machine to fold it in for a little while, like approximately 2 to 3 minutes. The later use spatula to mix it up again in case some flour is mixed in properly. I tried to bake a banana cake. Followed exactly the ingredients and steps, except I used 2 medium eggs. Problem is the cake turned out to be very tasty, but the bottom of the cake did not rise enough. The top raised good enough. What you think is the problem? Can it be my oven temperature? I just bought a new oven this year, I didn't use oven thermometer. Looks like you overmixed the batter. Next time try not to overmix it and you should not have this problem. I tried your banana cake. I have nothing but good thing to say about this recipe. I reduced the butter to just one stick (about 115g), I didn't want to open up another stick of butter. I also reduce the sugar to 115g. Add a bit more banana, just so I can use up the banana at home.. I added about a cup of semi-sweet chocolate chips. The chocolate goes very well with banana. The cake turned out to be perfect, moist and not too sweet. Simply delicious, I am tossing out my other banana cake recipes. 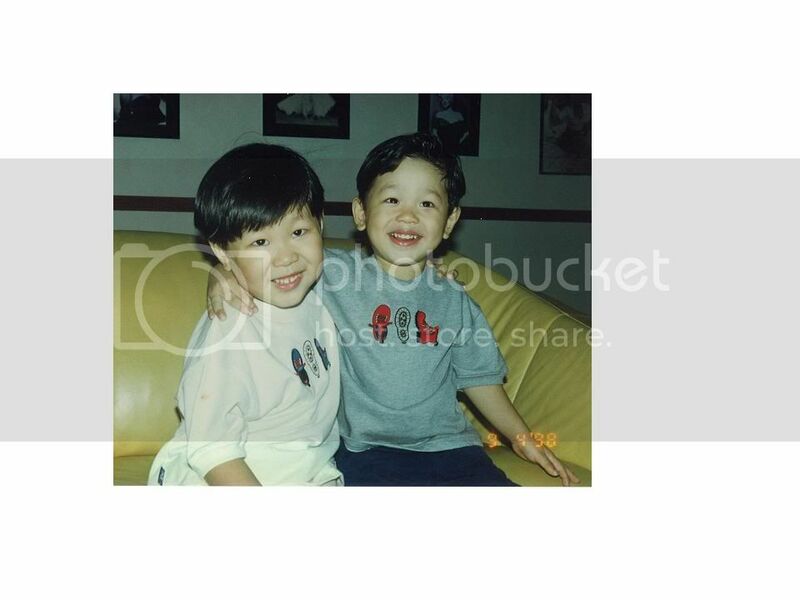 Hi Hugbear, if I dont have cake flour, can I replace with normal flour or self-raising flour. Can't locate cake flour here in the Coles Superkt at Melbourne. Many thks! Yes, you can use plain flour to replace. If you are using self-raising flour, then you can omit the baking powder as SRF has baking powder added into it already. Hi there, can I omit the bicarbonate of soda? I'm already using SRF so no problem with baking powder (can't get that either). also, how did u manage to arrange the banana slice so beautifully without having them sink in the cake? did u place them in the pan and later on, turn them upside down? the pic you shown, is that the base of the cake? Hi there, if you cannot find bicarbonate of soda, then just omit it. I just arrange the sliced banana on top of the cake before I put them into the oven to bake. What you see is the top of the cake. Just place the banana slices on top and gently press it down a little. It will not sink into the cake, don't worry. hi there, i've got no evaporated millk nor whipped cream, can i just use full cream milk? also, i am omitting the bicarbonate of soda, will using full cream milk makes the cake batter different? hello hugbear, how's it going? if i were to use whip cream, do i pour them in straight when it's in liquid form or do i whip it first till it reaches its peak before adding them in? also, i'm in Australia and the Coles Supermarket here, they only have vanilla paste and it's pretty pricey(say AUD6.30 per small bottle), so can i omit the vanilla as well? Thank you in advance for helping me out, see ya later. Hi Quinn, just pour the whip cream in no need to whip it up. No problem if you omit the vanila essence. Hi Anonymous, you can use full cream milk instead of evaporated milk. No problem at all. The taste won't be very different. The milk is for the mositure in the cake. i tried ur recipe and its turned out quite good. however i did a mistake by blending my bananas. turned out to be banana pureee and took me quite a while longer to get my cake done. the taste and texture was good nonetheless. how did u mash the bananas and wat was the tool used? Hi, may I know salted or unsalted butter is used in this cake? Hi Let's masak, I used salted butter. I tried your recipe, the cake turned out very well! I like it a lot. Thanks for sharing. I baked the banana cake yesterday. My kids love it. Next on my list will be the pandan chiffon cake II. Thanks for sharing all these wonderful recipes! just baked this cake an hour ago! Hi! This recipe looks really good and i can't wait to try it! I just wanted to find out how much 50gm dairy whip cream was in ml. Also can i use full fat milk instead of cream? Hi Niquita, you can use about 50 ml of evaporated milk in place of the cream. Oh my, with so many tips and advice given here, i think i will have enough confidence to bake this cake. Banana is always in our kitchen, we love to eat but cant finish the whole bunch of it, ended up throw the ripe ones away. Now i can fully use my bananas. Thank u for sharing. i bake it and it turn out so good! i followed the recipe exactly and i must say, the cake is the best banan cake ever. thanks a lot for the recipe. Love your baking blog! It's awesome. Quick question. If I use cupcake paper instead of round baking tin, should I reduce the baking time/temperature? Hi Kim, you can probably reduce the time by about 5 mins. Last night, my first banana cake was well done, thank you. I added choc chip cos my girl loves it, and reduced the butter to 125g and use the banana essence n castor sugar. I will definitely bake again cos this time DH asks for walnut to be added. can i omit using bicarbonate of soda? Whip Cream is the same as Whipping cream? How big should the banana slice be? There are two types of whipping cream. One is non-diary and the other one is diary. The non-diary one is the one you will use for frosting your cake. The diary one is usually used in mousse cake, cheese cakes, etc. The banana slices should be around 1/2 cm thick. TQ for sharing! I just baked it & it's great! I just made the best cake I ever made in my entire life! Thanks Hugbear for the recipe and tips. Thanks again and I will keep coming back! I'll reference you from my blog if you don't mind yah? You are most welcome Galronni and thanks for the reference. You are great. Do you have a website? If not Here is a free tool to promote this blog. I had previously tried baking many banana cakes with the "gently fold in the flour" technique at the end. The cakes always turned out super dense and frankly, rock-hard. Last night, I went through this recipe, taking into account all the tips you've given for all the above comments. The banana cake that came up was super tops! I've never made a cake so soft and fluffy, so tasty and not-too-sweet before! I will probably tweak a bit to try to get it a bit more moist and not so crumbly. Any advice for me? I've tried many times to bake banana cake using the technique which ends with "fold in the sifted flour" at the end. The cakes have always turned out superdry and rock-hard. Last night, I tried out your recipe, taking into account all the advice and tips you have given to the earlier comments. The cake came out FABULOUS! I'm over the top with joy. Soft, fluffy, fragrant and not-too-sweet. My 4 kids polished off most of it this morning for breakfast. Thanks so much for sharing your recipe and being so generous with your time and advice. Thankyou so much for this recipe! It's heavenly! But I did make alittle changes coz those left over bananas I have r not v ripe n soft.. So I actually blend together the bananas n condense milk( replaced 20% with water ) n used 170grms of water n vanilla n add after the egg mixture. Then I added chopped walnuts right before baking. Oh wow! It came out just right! Not too moist nor it's too dry. Not too sweet but w a nutty flavour to disguise my not too ripe bananas. I can say, it's the perfect banana cake for me. Thanks a million for such a easy n wonderful recipe! Hi Mummycam, you are very clever to twitch the recipe to suit your needs. Thanks for sharing and I am sure for those of you who may have come across the same problem will know what to do next time.